AEP's Mountaineer plant in New Haven was the first in the world to use new technology to both capture and sequester carbon dioxide emissions. He says he’s expecting the new rules to emphasize carbon capture and storage technologies. "It’s going to have a disproportionate impact on West Virginia, on our coal industry. I understand the concept of “technology forcing”—there are other examples of that in federal statues—the principle of adopting standards that can only be met if technology is developed to achieve them," he said. "We know that CCS, is not commercially available to capture the quantities that are necessary at a full-sized coal plant." Van Nostrand also believes in the short-term, the new regulations will deal a difficult blow to the coal industry and coal jobs. "It is certainly going to be very very expensive, and it is going to hit the coal industry very hard. I think federal legislation needs to be crafted in a way that doesn’t harm a particular industry or particular region," said Van Nostrand. But the professor believes there’s a silver lining for the state, and for the industry. He says this involves using the state’s forests resources, to bring forward new solutions. "We have tremendous biomass potential in this state, from sustaining our biomass residues. We’re the third most forested state in terms of our land that’s covered with trees. Processing those residues to co-fire with coal, that I hope is the solution that I hope our delegation is pursuing with the EPA," he said. 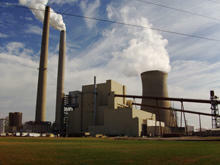 The EPA’s new rules on coal-fired power plants are expected to be released Friday.